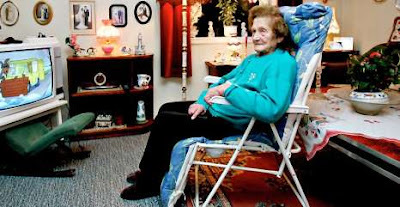 Thea Andersen - aged 103 - is unable to get a spot in a nursing home, even though authorities admit she meets all the criteria for one. Thea Andersen's family applied for a nursing home spot in September, but local authorities turned her down, saying they had no room, newspaper Bergens Tidende reports. Neither her age, nor the fact that she can hardly see or hear, and is terrified of being alone, gives her an advantage in the queue for elderly care. A nurse visits twice a day, apart from that Thea's two children and her two sisters have the responsibility for her care. Her sons Jonny, 63, and Hendry, 67, and sisters Sally, 83, and Ellinor, 78, do their best to be with Thea around the clock. "We have the advantage of being retired, otherwise it would have been impossible," son Hendry told the newspaper. "The local authority is gambling on us being here. We don't have the conscience to cut out the help as a protest," Jonny said. Apart from her physical handicaps, the 103-year-old is in good shape, and believes hard work is the secret to her long life. "I have been a working person, all the way. So now I think I should get some time off," Thea Andersen said.